This article first appeared in The Edge Financial Daily, on January 13, 2017. 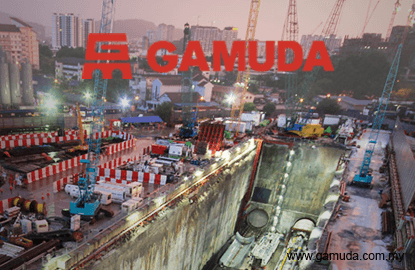 Maintain buy call with target price (TP) of RM5.80: Gamuda Bhd is our top large-cap pick in the sector, as it is the best proxy for a slew of upcoming transportation-related projects. Its strong reputation for mass rapid transit (MRT) Line 1 and the project delivery partner (PDP) appointment for the Penang Transport Master Plan (PTMP) provide it with leverage for other large-multiplier projects such as light rail transit (LRT) 3, Gemas-Johor Baru double tracking and Pan Borneo Highway Sabah. Gamuda’s outstanding order book now stands at RM8.9 billion, which does not include the PDP fees for MRT Line 2 above-ground works. The final contract value for the whole project will only be known once all the packages are awarded, which will likely be about RM30 billion. Forecasted financial year 2017 will be the start of a new earnings growth cycle as the maiden contribution from MRT Line 2 starts to filter through. We expect margins for MRT Line 2 tunnelling to at least match that of MRT Line 1 given its depreciated tunnel-boring machines, while the project value is also higher on a per kilometre basis. There are expectations for the Syarikat Pengeluar Air Sungai Selangor Sdn Bhd deal to be concluded in the second quarter of 2017 at close or a small discount to its book value of about RM2.8 billion. There could be special dividends now, especially if there are further delays in the PTMP. This would somewhat compensate investors for the earnings void. Over the longer term, the PTMP will be positive as Gamuda could secure long-term construction earnings and a firm footing in Penang’s property market. We maintain our “buy” rating and sum-of-parts-derived TP of RM5.80. We have accounted for the dilution of warrants and corresponding increase in cash raised from full conversion while also assuming some marginal wins outside of MRT 2 Line 2.